Awaiting another day in court, accused serial stowaway Marilyn Hartman remained Friday at Cook County jail, where she’s scheduled for a psychiatric exam to determine why she does what she does. But another question, is how? Across America, Marilyn Hartman has tried repeatedly to get past security to stow away on airplanes, and it’s believed that she’s succeeded at least three times. 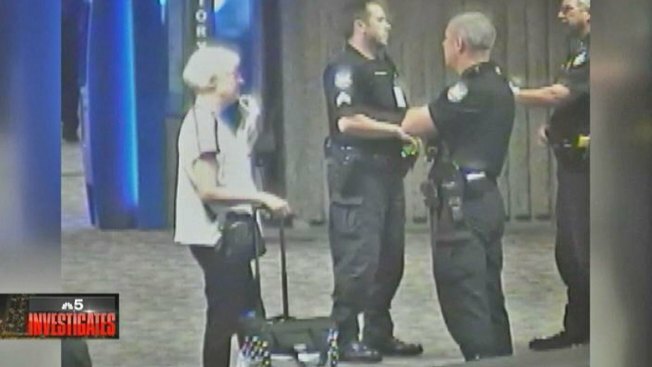 Her methods of actually getting aboard aircraft are not entirely clear, but security video of one of her attempts last January from the Minneapolis-St. Paul airport shows the casual way the 63-year-old grandmotherly figure attempts to slip past the Transportation Security Administration. In that video, recorded January 9, Hartman is observed in the security line attempting to blend in with the man in front of her as if she’s his traveling companion. As his ID and boarding pass are checked, Hartman slips past the agent. But that TSA officer spots her and demands to see her documents. She steps aside and fumbles in her purse before eventually slipping back into the terminal. The attempt was thwarted, and airport police spotted Hartman sleeping on the airport’s mezzanine level about an hour later. Security cameras showed officers, who recognized Hartman, checking her identification and taking her away in handcuffs. When Hartman was arrested last year in Phoenix, even she seemed amazed at what she had managed to do time and time again. "Why has the government allowed me to get past security points until I forced the issue back in February?" she asked. "And pretty much had to beg to be arrested?" Getting arrested is something Hartman does very well. When she was discovered in a vacant room at a Nassau County Florida resort a month after the Twin Cities incident, she told investigators she had flown in that day aboard an aircraft on which she had stowed away at the Minneapolis airport. The TSA disputes that claim. Hartman is due in court again June 5.